Good Evening and Happy Friday to you! Wow what a busy and very exciting week we have had… Mark has been creating some incredible new stamps for release early in 2018! Cannot wait to show you!!! Here I am again with another ‘Visible Image’ Fabulous Friday project. This one is very easy to achieve, and I’ve used this technique at some of my recent Inky Workshops. The card stock I used is Watercolour card, and I heat embossed the large butterflies using Wow Bright White embossing powder. 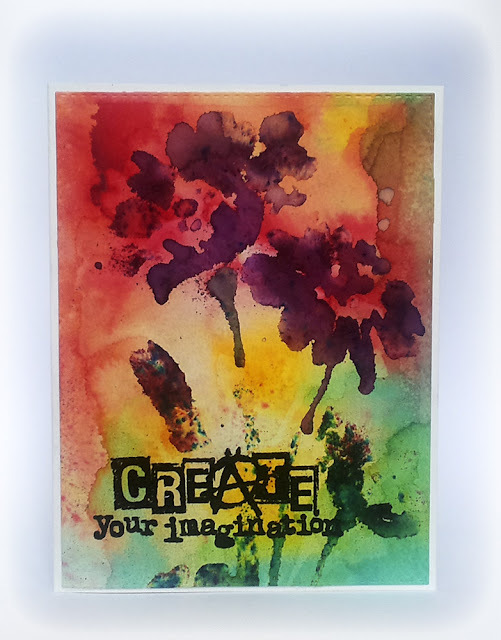 I then sprinkled some Brushos onto the card and spritzed with water, adding more colour and more water to get the effect I wanted, I then left this to dry naturally. 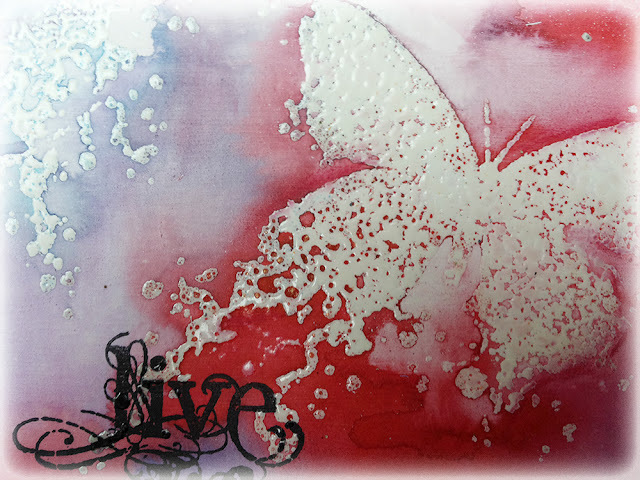 Once dry, I added the smaller butterflies using a Distress Ink, then stamped and heat embossed the sentiment using Ebony embossing powder from Wow. We hope you have a fantastic weekend.. we will be back with stunning inspiration from NEW DT member Lynn Good tomorrow, and Veerle will be here on Sunday. Hello there! Helen here with my latest card! I have been busy creating some backgrounds ready for some of our NEW stamps! Had lots of fun with brushos, Lindy’s sprays and Dylusions paints! I absolutely love the drama of it! Hope you do too. I am entering this in the Simon Says Stamp Monday challenge! The theme is spread your wings. Preview #12 of our February release will be here on the blog a little later! Hello! Thank you for coming to visit us here on the Visible Image blog today. I had a chance to get inky yesterday, and had a lot of fun creating backgrounds using Brushos. I sprinkled red first then spritzed with water before adding some yellow and spritzing again. 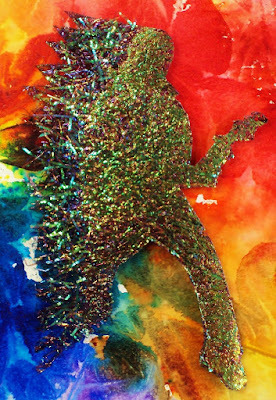 I love the different random patterns the paint makes. drying again and repeating. I sprinkled extra here and there for a more dramatic effect. Once I was happy I chose my favourite part and cut it to size. I then stamped our gorgeous feathers and the beautiful sentiment using black versafine ink. Then splattered some diluted white acrylic paint here and there. 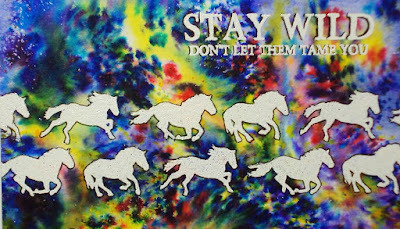 I love how it turned out..
Have you seen our NEW stamps previews yet? If you’ve missed them you will find them HERE! Preview #5 from our February release will be posted here a little later today! And Corrie will be here tomorrow with more awesome inspiration. Hello and thanks for coming to visit us here on the Visible Image blog today! 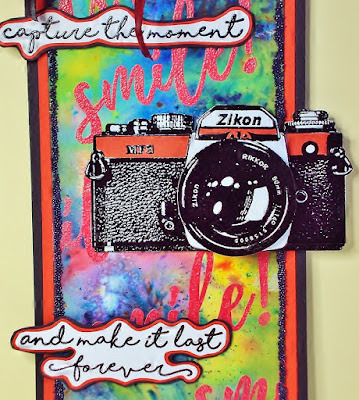 I’ve created a tag, for my Visible Image Stamps inspiration this week, using the awesome Capture The Moment stamp set. 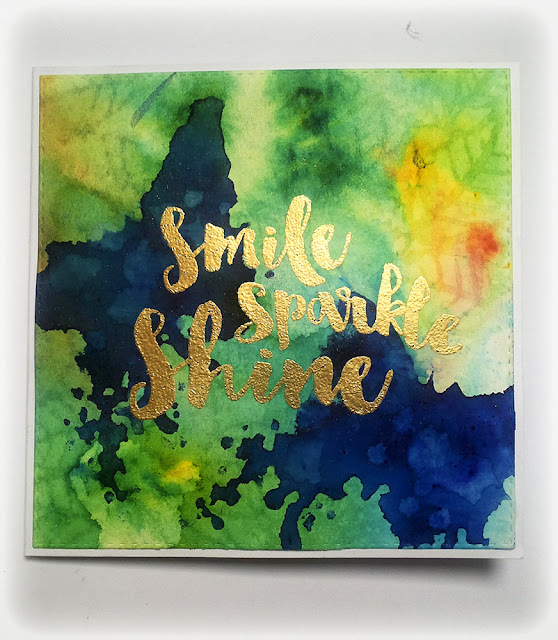 I used Brusho’s for the background, sprinkled and spritzed, and when dry, I stamped and heat embossed the ‘Smile’ sentiment, which comes in the set, with Wow red Embossing powder. 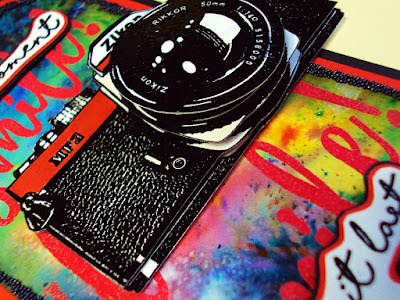 I stamped the sensational ‘Camera’, 5 times, and heat embossed them with Black Embossing Powder, I then fussy cut them, reducing the size each time, to decoupage them. I coloured the red bit in with a Sharpie pen. The sentiment was stamped and heat embossed with Black Embossing powder, and fussy cut, matt and layered onto red and black card. I used some acrylic glue around the edges of the tag, and sprinkled some black micro beads, and left to dry, before adding the camera, and the sentiment using 3D glue gel. You will find lots more of Pauline’s inspiring cards and projects over on her blog. If you have missed any of our recent posts, you will find them HERE! 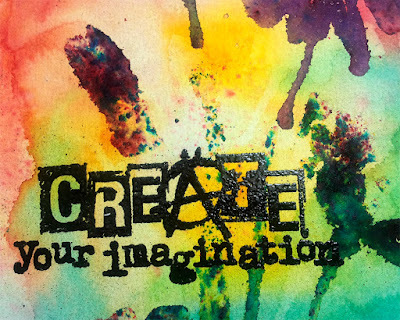 And don’t forget to show us what you create with our stamps for a change to WIN a £25 coupon over in our Facebook group. Hello and Happy Saturday to you! Hope you have a great weekend planned! I created a video for these two happy Brusho cards. You’ll find a list of the stamps I’ve used at the end of this post. We will be back later today with another preview from our February release! Hi There! Wow we are on a roll today 🙂 So much awesome inspiration from the team! Today is my first day to show you a card made using fab Visible Image stamps, as part of the lovely design team. I’m thrilled to bits to have been chosen to join them, from the many great applications they’ll have got. So here we go……. 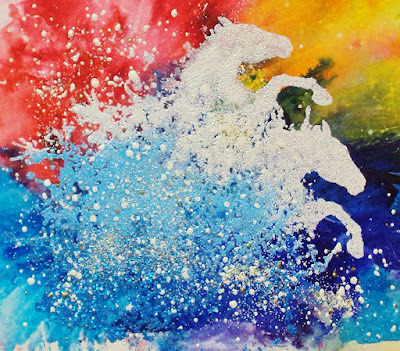 For the background I used Brushos in just 2 colours, then while it was still wet, I used a spritzer to blow the ink around, I love this effect. 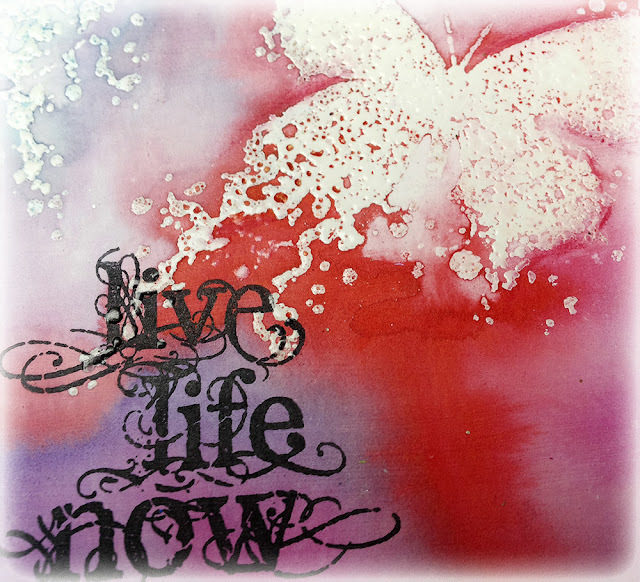 I then stamped the image and sentiment in black Versafine and heat embossed with clear embossing powder. All the other stamping was done with various Distress Inks. Awesome card! Love the effects you’ve created with the Brushos. Thanks Karen 🙂 You will find more of Karen’s fabulous work over on her blog. We’ll be back shortly with Kim Bacon’s regular ‘Marvellous Monday’ post. 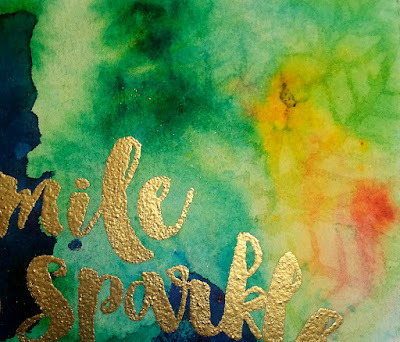 Kim has an absolutely gorgeous card to share with you today! Good Evening! Hope you are well and Monday has eased you gently into the new week. What a fantastic week we have had here in Pembrokeshire weather wise. I have spent a lot of time in the garden weeding, planting and generally making things look nice. I have loved every minute! That is saying something coming from someone who used to enjoy being in a neat garden but hated working on it! And what an exciting weekend for our Visible Image group! Competitions and flash prizes! Well done to the winners! If you would like to see what they created and their prizes then go to the link at the bottom of the blog and join the group! Right so my make for today is a card I made using just a sentiment and the Harlequin stamp. A classic example of the stamps doing the work so there really is no need for embellishments! I started by washing a piece of watercolour card with warm tones of colour using Brusho paints. A pinch of the powder mixed with a drop of water goes a long way! 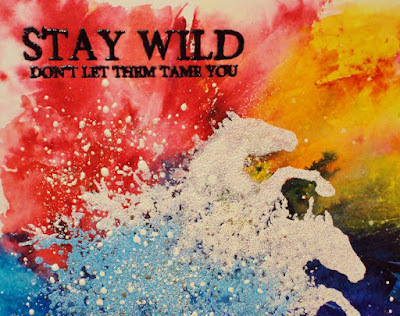 The colours were blended while wet. Left to dry for as long as possible, I usually do this the day before. Next I took the Harlequin stamp, sprayed it with water and then stamped it onto the painted card. Using a sheet of kitchen roll I then mopped up the moisture and repeated this over the whole sheet keeping the images in line with one another. I then splattered water over the piece of card and again mopped up the water with kitchen roll. I used white embossing powder with the sentiment stamp and layered it on white card before mounting it on the card base. 3 faux gems add a little bit of sparkle at the corner. 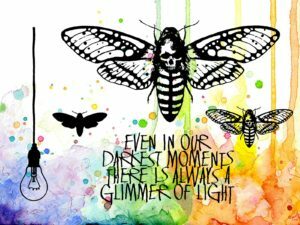 You will find more of Kim’s inspirational work over on her blog. We will be back tomorrow with a beautiful new card from Suze. Visible Image stamps and Brushos = WOW! Good Morning 🙂 It’s fabulous Fridaayyyyy!!! Did you get to watch the eclipse, it’s gone SO cold! There are some fantastic photos online. It’s Fabulous Friday again, and my turn to share some Visible Image Love. 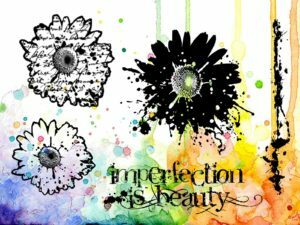 I think it’s a beautiful stamp set, but see what you think……. I’m sorry about the quality of the photo, the light has been so gloomy of late, that I had trouble showing all the colours. The background is Brusho’s, sprinkled and spritzed with water, until I got the effect I wanted, mopping up the puddles as they formed, to keep the colours fresh. I then stamped the leaf using Versamark, and heat embossed using Green and Orange embossing powders, I also masked off areas of the stamp so’s I was just stamping with the small leaves, I heat embossed the sentiment with Orange embossing powder. Then, you know me, there has to be bling, so out came my Orange, Green and Red Stickles, and glittered everything, lol !!!! 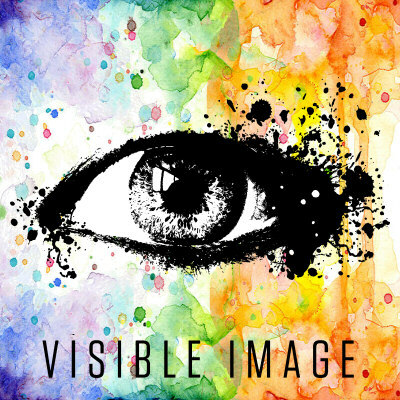 We are having lots of fantastic entries into the Visible Image ‘Show and Tell’, if you make a card with Visible Image stamps then please do enter, you could win some new stamps, details HERE. 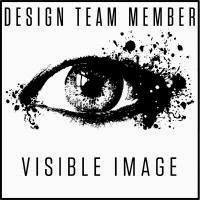 Join the Visible Image Facebook group too, there’s always lots going on, take a look HERE. I’m off to the NEC today, for some retail crafty therapy, lol !!!! If you see me, stop and say Hello. Have a great day and come back tomorrow for Saturday’s inspiration from Amber.